Do you also have a tassel necklace? Do you want to own one for yourself? 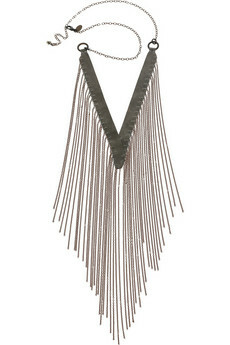 Please read on…ACB’s chain and leather tassel necklace will bring a subtle shot of boho-chic to any off-duty ensemble. 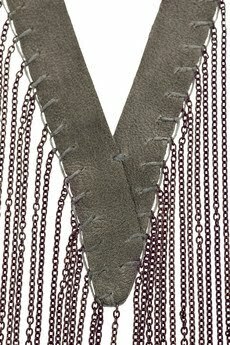 Team this necklace with a V-neckT-shirt for an effortless addition to your look.It can be well matched with a Kain tank,Doma jacket,Christian Louboutin boots,Chloe bag and 7 for all mankind jeans.Bronze metal chain-link necklace with leather detail. ACB necklace has chain tassels and a designer-stamped tag and and lobster clasp to fasten at the back of the neck.Drop of necklaces measures approximately 57cm/22 inches.Selling at a price of ￡333.30.